Sometimes things just don't work out how I imagine them in my head. Flush from the success of my window patchwork and my corner office, I thought I'd teach myself how to do paper piecing. It was all going pretty well, and then I got to the second-to-last piece. Back to the drawing board. It seems that each piece can only have one seam, and I tried to do two. If any paper piecing experts are reading this, is that the case? I'm off to do a little more research. I just thought it would be good to share the failures along with the successes to keep me honest. I have a book to give away here on the blog this week, and you can give away 20 books if you hurry! I'll tell you about mine last, because it's not as important or exciting as World Book Night! Have you heard about this? I should have mentioned it sooner, but I signed up at what I thought was the last minute and then didn't think about it again until I got an email the other day that I had been accepted and would get the opportunity to share twenty copies of a favorite book. So, what is this World Book Night thing, you may be asking? It started last year in the UK and has expanded to include the US and Ireland this year! It's a charity for the promotion of literacy and reading, which is very dear to my heart. Anyone in these three countries can apply to recieve twenty copies of a favorite book (you choose from a list of 30 very good books-I had to really think about which I wanted to share) to be given away in a location of your choosing-preferably to non-readers, on April 23. I chose Peace Like a River , which is that rare kind of book that stays with you for years and years. Narrated by a young boy whose voice has been compared to Scout Finch or Huck Finn, it is the story of a family and a tragedy and miracles and goodness. I can't wait to share it! Go apply right now, the deadline is Monday, February 6th at midnight EST. You don't have to write long essays for each question, just give succinct but thoughtful answers and I think you'll have a good chance at being accepted. At least that's what I did. Now for a little blog giveaway. It's been awhile since I've done one, but I just received a copy of the new paperback edition of Creative Quilting with Beads, which I contributed to a few years ago. It's got lots of fun projects, and even if you don't want to replicate them exactly, it's good for inspiration for everything from bags to wall hangings to fridge magnets (I think theses are super cute and would make great little brooches). I recently cleaned out my bead stash, so I might even include an assortment of seed beads and a little sewing kit along with the book. To enter, just leave a comment and tell us about a favorite quilting project or beading project (links to pictures are encouraged!) you've done or dream of doing. I'll leave the comments open until next weekend. I want to do better with this whole blog thing, so I'm playing around with some ideas and design and improving my photography, and just generally figuring out how to make time to do more here. So please don't mind random changes in the look of things around here, and I hope I don't get too rambly with my posts while I figure all this out. Why have I never heard of this before? Art Project by Google. High-resolution images of prominent works of art from the best museums in the world. You can even walk around the galleries, Google street-view style. When I lived in Northern Virginia, I spent as many of my days off as possible visiting the museums on the National Mall and all around town. I was pleased to see that one of my favorites, the Freer Gallery, was included! Although the National Gallery is missing, which was another favorite. The Sunday night concerts there were one of my favorite D.C. events. I think I need to start saving up for one of these bags. Is that yellow one not just perfect? I just got this book (by this blogger/photographer/chef), and I love it. I can't wait to work on my food styling and photographing. It's a challenge, since during the week I'm not home during daylight hours long enough to spend any time taking pictures, and I do most of my eating at work. While I enjoy the spontenatity of iphone photography, I'd like to improve my regular photography (not to mention my food-stying skills, which are currently non-existent). The first words out of my mouth when I saw this were HOLY COW. And then I bought the pattern. Three of my favorite things-quilts, knitting, and bees (or at least honeycomb), all colliding in one, enormous, clever, beautiful project. It may take the rest of my life, but I am going to start making hexipuffs whenever and wherever I can. A long ago thrift store find, this little display shelf was dusty, dark wood. I think it still needs one more coat of glossy paint, I just had some flat spray paint, but I love it so much more in white. It's nice to have a place to showcase some tiny treasures that I love. A simple appliqué quilt I started long, long ago. I finished sewing the three big flowers and their stems, so now I just need to get some batting, figure out the backing, quilt, and bind the whole thing. I love the saturated colors of these batik fabrics. I know they're maybe not so modern and hip, but I don't care. I'll probably hand quilt it with lots more of the same bright colors. It's nice and chilly in the evening, so I've picked up the knitting needles again! This is the Tea Leaves cardigan (Ravelry link) I started in March, and that is the bottom edge, just about ready to be cast off. Then I'll just have to do the sleeves and the button band, and I'll have a new sweater for this autumn! There are a couple more projects in the works, and all this suits my ADD style just fine. I've also managed to hem my living room drapes, which have been hanging there un-hemmed for longer than I'd like to admit. There's also another porch project that I hope to finish this weekend that I think is going to be very cute. Luckily, Winston keeps me company in my little house studio as I work on all these projects. It really must be fall, his summer haircut is growing out quite nicely! I don't want you to think I'm going to neglect Hey Lucy, just because I have another blog. I made a lot of things in December, so I'll tell you all about them this month. I decided to do a little quilting, and made a log cabin pillow with some of my favorite shades of pink & green. It was part of my annual Christmas swap with Yvonne of Yvestown (I am a lucky duck, we've been doing this swap for four years now? or is it five?). Yvonne is a super good swapper, so I wanted to make sure I sent something worthy of her beautiful home. I had no intention of disappearing for three weeks, but I guess that's just what I did. I've been both busy and lazy. Well, not so much lazy, just worn out from the busy. And there was a bit of a cold somewhere in that time too. Last week I decided to enter a contest at Veer.com to win a MacBook Pro. I knew the competition was going to be tough, but I forced myself to try anyway. Veer is a stock photo/illustration/design site, so most users are professional graphic designers. So the contest was to step away from the computer and recreate their logo with real materials. Multiple entries were allowed, so I did three: a mini quilt, a papercut, and a candy mosaic. The winner was pretty darn cool, and the ten runners-up were also really great. I'm still happy I went without sleep and ate too much orange candy in my attempts. I do love my papercut one, although that was my first attempt at papercutting, and it was not easy. I want to try it out with different kinds of paper, because everything looked terrible when I tried to use a blade. I ended up using paper scissors in the end. 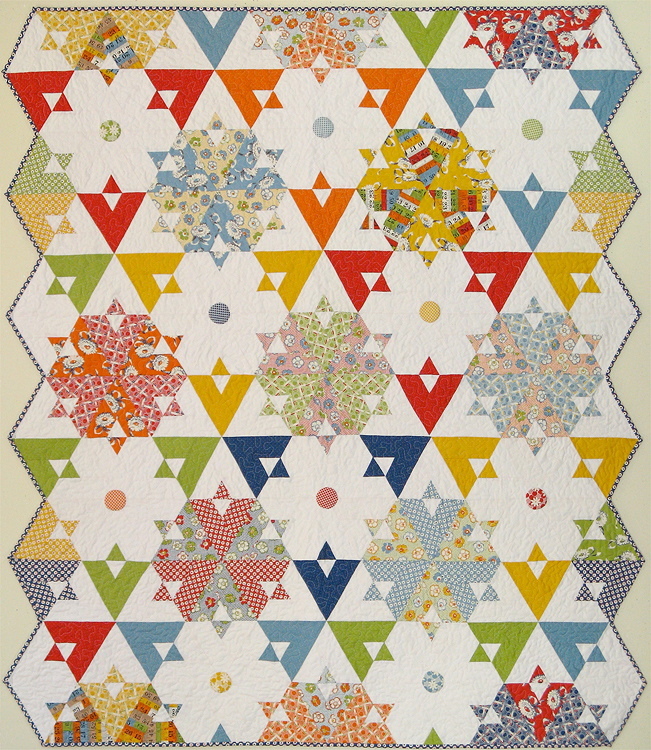 I think I'll remove the letters from the quilt and turn it into a little doll quilt, I love the bright, juicy oranges. I've been doing a little cooking as well, and had myself a little tea party one afternoon, while watching Howard's End. You don't really notice the food in that movie unless you watch it hungry. I speak from experience. So I was prepared this time. One of my favorite scones ever are the ginger scones I would get at Teaism, when I lived in Alexandria, Virginia. So I used a cream scone recipe and added finely chopped crystallized ginger and they may not have looked like much, but they were just perfect. I recommend that you try this sometime. My former boss is an avid fisherman, and brought back a whole lot of yellow fin tuna from a recent trip. So I decided to use some to make fish & chips, but with a little Asian twist. I cut the chunk of tuna into fat sticks, dipped them in beaten egg, and then coated them with panko crumbs. Then I fried them in a little oil (maybe a half inch deep), turning so that all the sides got nice and brown. I made two dipping sauces instead of tarter sauce. The first was my usual wasabi cream sauce and the other with a spicy mayonnaise, which was simply mayo with some srirachi chili sauce (also known as Rooster sauce), and a little squeeze of lemon. Yum! It was delicious and really easy. Now I'm hungry, and we are out of bacon, so I think I'm going to get myself dressed and head over to the local diner for breakfast. Hey, hi! Remember me? I know, I know, it's been awhile. So. I mentioned this in passing on twitter, but in case you missed it, someone climbed over our fence last weekend and stole eleven of my chickens. Why would someone do something so terrible? I've been completely heartbroken over the whole thing, and not sleeping too much, worried that they'll be back for the remaining six. Those six, by the way, seem pretty traumatized by the whole thing themselves. They stopped laying completely for a few days. In fact I've only found four eggs the last couple days. Of my six newer chicks, they took four. One of the two has lost all her friends and wanders around the yard alone most of the time. I hope the thieves just fell on hard times and really wanted some laying hens so they could have eggs to eat, but I know the chances are slim that any of them are still alive. I feel sick just typing that. In the meantime, I've put a padlock on the chicken coop, and they get locked up tight every night now. The dogs were unusually agitated for several nights in a row, and I think the robbers may have come one night to case the joint, and then dogs may have chased them away before they could get all the chickens. We reported it to the sheriff, but I don't expect much will come from that. Anyway, I haven't felt too creative lately, as you might imagine. I did have to make a couple quilt blocks for a co-worker who is having a baby. Several other co-workers organized a friendship quilt-a-long, which is so great! I got a square of blue gingham, which I cut up to piece together this little house block. It's not too exciting, but cute enough I think. I've also been writing app reviews for an iPhone blog called Appmodo. So far, mostly just games, but I hope to get to try out all sorts of different apps eventually. I want to work on building a portfolio of my writing, so this will be a good addition. Plus, free apps for me! Of course, I've been using all my writing mojo up, and haven't had any leftover for my own little blog. I'm starting to get more into the swing of it, though, so I should be back here regularly now. I like giraffes, don't you? Maybe it's because they are tall that I find them so appealing. I do not, however, have quite as long a neck. This is from my trip to the Boise Zoo last month. It's a nice little zoo, and I had fun getting photography tips from my brother as we walked around. It was like we had our own little photo safari. I've been working on my jelly roll quilt. 126 triangles down, 78 more to go. I've started putting pieces up on my design wall and I think I'm going to love this quilt. I really like creating my own originals, sorting through fabric and finding just the right combination, but sometimes it's so nice to just let someone else do all the thinking work, and just enjoy the patchwork zone that I get into, cutting, sewing and pressing. Winston is laying on his back, paws in the air, and just started wagging his tail for no apparent reason. He's such a happy dog, I can't help but smile when I'm around him. Yesterday morning I was loading the car with bags for Good Will. I left it open while I went back in the house to get ready for work. When I cam back out to leave, a good 20 minutes later, there he was, sitting in the driver's seat, ready to go! I was tempted to take him with me to work, but it wouldn't have been much fun for him to lay under my desk all day. Too much stuff on my to-do list, too much stuff to make, and too much stuff in my house. That's the theme for this weekend, I think. I will have to clean the bathroom and do the laundry and hopefully clean out the dresser and send some things to Goodwill, but mostly what I want to do is make things, so let's just talk about the fun, creative stuff, shall we? It's this little baby jacket from Debbie Bliss. Stash yarn from I don't even know how long ago, and a scrap of fabric for the flower. It was a quick little knit for my new niece, and I hope to see her in it this Winter. Baby knits are so perfect for Summer knitting: small, quick and portable! Which reminds me that I really need to go to the beach sometime soon, before Summer is over (the portable part of that last sentence is what made me think of that, in case you were wondering how my mind works and what knitting has to do with the beach). I decided to be a little less lazy last night, and pulled out my orange sweater to work on while watching the last season (sniff!) of Buffy the Vampire Slayer. I had started the first sleeve, but stopped because extreme laziness prevented me from reading how to do the M1L and M1R stitches that I needed to do to move on to the next row. It turns out those increases were not as difficult as I remembered, and now I'm nearly done with the first sleeve. Here's hoping I'll have pictures of a finished sweater soon! One more sleeve and it's all done. Just in time, too, since the new Interweave Knits just arrived, and I really need to make a couple sweaters from it (Rosamund's cardigan and the Nordique Swing, in case you were interested). I love the light brown polka dots. The plan for this weekend is to get a few squares done. At the other end of the spectrum, I picked up a jelly roll while visiting my favorite quilt shop in Boise earlier this month. Then I found this pattern, and thought it was quite adorable, and started slicing and stitching away. Sometimes it's nice to have someone else do all the work planning and thinking, and to just sit and sew. I think I'm going to have to get over my box building frustration sooner rather than later. I seem to have filled my first box right up! I'm feeling a little greedy, and want to grow everything! I planted some seeds, but also went on a little shopping spree at my favorite nursery. They had so many varieties of tomatoes. I had space for four, but the selection was so overwhelming that I ended up with a yellow (Lemon Boy), a purple (Cherokee Purple), and two red cherry tomatoes (Sweet Million and Red Currant), but I think I really ought to have a couple more reds, oughtn't I? And maybe a green. I want to be able to can some for the Winter. Peppers are posing the same problem, I got a jalapeno, a bell pepper, and a cherry red, but there are so many fun varieties, and those three seem rather ordinary. I'm very excited about the French Sorrel, which was a complete impulse buy, but I tasted a leaf and love the citrus-y tart taste. It's a perennial, so hopefully it will spread a little, maybe into two square feet, from the one it's now it. It can be divided, as well, so if it does like the conditions here, I'll definitely spread it around. Here's the view from our back fence. As you can see, I have plenty of room for a lot more boxes. I'd like to grow some berries against the fence to the right, and maybe put in a few fruit trees. Nothing has happened yet in my potato cans, no signs of green, although most of the potatoes definitely had sprouts in their eyes, so I'm expecting to see something soon. I also planted a green globe artichoke next to the potatoes. I love artichokes! For prettiness, I planted one square of my box with candy cane zinnia seeds, and another with a tiny dianthus from the sale table. I planted some basil seeds, but also brought home a flowering basil because they were filled with bees at the nursery. I can't seem to find the tag for it, but I think it's cinnamon basil. There's also a Japanese eggplant and a couple zucchini plants. Other seeds I planted include peas, two kinds of beans, two kinds of cucumber, radishes and cilantro. And yet I need more. I think it's already too hot for any sort of lettuces or greens, but I have seeds for all sorts of kales and chards and lettuces that I might start toward the end of Summer for Fall planting. Who else is working on a vegetable garden? Share what you're growing, I want to know! I got myself good and worn out doing all that planting on Saturday, not to mention dirty and sweaty after weeding along one side of the box. I plan to lay down weed cloth and mulch and possibly some stepping stones this week. I think I need a chair or two out there, to sit and enjoy the plants in the evening. If only this one wasn't sold out everywhere. After all that activity I did a lot of resting today, and did a little hand sewing while watching Last Chance Harvey this evening (it was sweet, but I love Emma Thompson, so I like everything she's in). I am trying to come up with some more pincushions, and I think I'm on the right track, but it needs just a little something more. I used the same fabric I used for my headscarf, but maybe I need to stick to smaller prints? I'm going to have to think about it, but I really want to get some things in my shop, it's looking so sad and barren at the moment. I also decided to start un-picking and re-stitching the latest quilt top from my mother-in-law. She said that her mother started it when she found out she was pregnant with her, but she wasn't much of a sewer or quilter. I love these fabrics so much, and the yellow solid is so nice, and unusual. As I was getting started and looked at the back I realized that she must have used paper to piece it, there are all these little bits. As I'm unpicking I can feel the frustration and impatience the seamstress must have had. There are places where the sewing machine was obviously acting up, and she seems to have just plowed on through. None of the points are anywhere near meeting, and the seam allowances are 1/8" in some places and well over 1/4" in others. So she may not have had much skill for needlework, but she did at least have an eye for color, I hope she won't mind my re-doing and finishing her quilt.